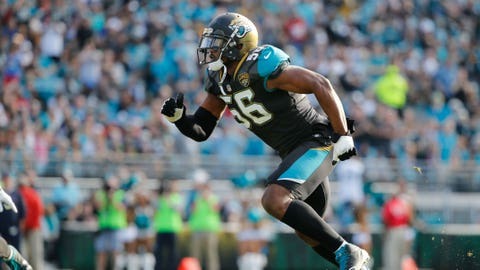 The Jacksonville Jaguars declined to exercise the fifth-year option in defensive end Dante Fowler's rookie contract. JACKSONVILLE, Fla. (AP) — The Jacksonville Jaguars declined to exercise the fifth-year option in defensive end Dante Fowler’s rookie contract. The decision could mean Fowler, the third overall pick in the 2015 draft who had eight sacks last year, will become a free agent in 2019. Had the Jaguars picked up the option, they could have been on the hook for $14.2 million for Fowler in 2019. The contract would have been guaranteed only for injury. It would have been a huge risk to take on a backup to Pro Bowl pass-rusher Yannick Ngakoue. Fowler has 12 sacks in three seasons, plus two more in the 2017 postseason. He missed his entire rookie year in 2015 after tearing a knee ligament during his first minicamp. He also has dealt with off-field problems, including hitting a man and throwing his groceries in a lake in 2017. Fowler was arrested in Miami Beach in March 2016 and charged with misdemeanor counts of assault against a police officer and resisting arrest without violence. The charges were later dropped. That arrest came a little more than two weeks after a video surfaced showing Fowler refereeing a violent fight between his girlfriend and an ex-girlfriend. He also has a long list of traffic violations, including several for speeding.